- Must credit with links to my blog if using. Welcome back to my blog! I’m so happy to say that now I have another SIZE for my printables YAY! I have the Mini happy planner files included in this new printable and will be available from now on, I will be working on adding more sizes as well, maybe Erin Condren and Personal size but for now enjoy this Mini HP size if you own one. I been getting request for it, so I decided to finally look into the page sizes, I also got me a Mini because I did not own one. *** I’m having a 40% OFF on all SUMMER Items over at my Etsy Shop don’t forget to check it out. Remember these free printables are for personal use only. If you would like to share these printables with friends please link directly to my blog, and not to the printable file itself. Don’t forget to join out facebook group for more freebies and for updates! Click HERE to join! 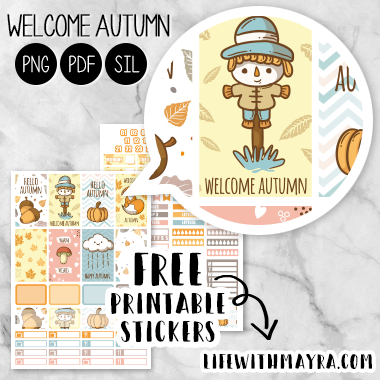 Click the preview below for more info on this fall sticker kit or simply use the links below the image for the download files. Each Zip file includes the .PNG .PDF and Cutfiles for Silhouette machine.